You can mix and match different vegetables, herbs and seasonings to suit your tastes. Try adding tomatoes, peppers, potatoes, corn, etc. This is just one combination to try. optional: fresh chopped herbs such as dill, oregano, tarragon, parsley, etc. Preheat oven to 400°F or heat a grill to medium. Cut 4 sheets of aluminum foil into 17-inch lengths. Drizzle a little olive oil over each piece of foil. 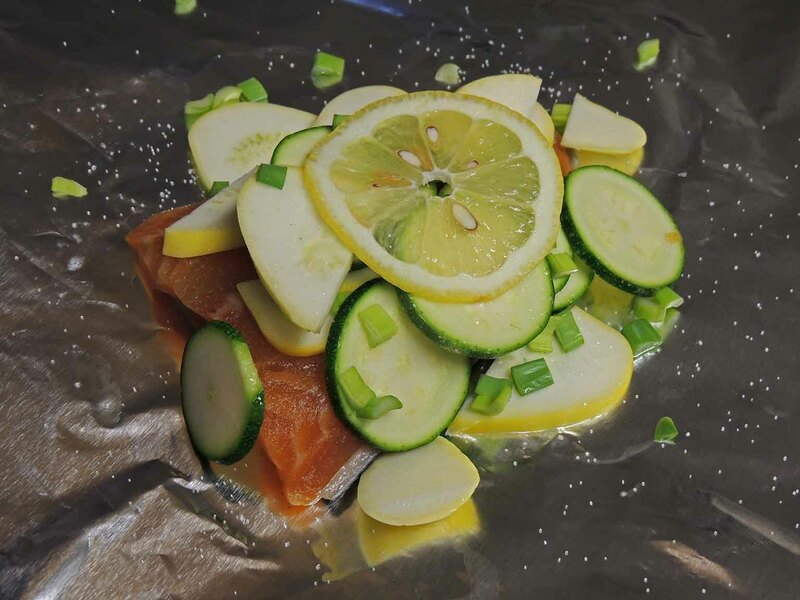 Lay the fish in the center of each foil piece. Sprinkle with salt and pepper. Layer the zucchini, summer squash, shallot, and green onion over the fish. Sprinkle with salt and pepper and drizzle a little more olive oil over. Sprinkle with fresh herbs, if using. Lay the lemon slice on top of the veggies. Wrap sides of foil inward then fold up ends to seal. Place on a rimmed baking sheet and bake until salmon has cooked through, about 25 – 30 minutes. If cooking on a grill, place on hot grill for 8 minutes. Flip and grill for 5 more minutes. Carefully open foil packets, drizzle with juice from half a lemon, and serve warm.